Hopefully you got my email about certain matters; the fact that Titan publish Mouse Guard in the UK might also have something to do with it! Mayhem: Glad you like the piece! It took a while to fit the characters all in so that they could all be seen. I also put in some subtle signs as to which mouse is which turtle...but you can e-mail me if you need me to tell you the order. Christian: Hmmm., that's odd. I'm listening to it now through the link on the site. You can click on the link or right click and save it (PC only). Are you Mac or PC and which browser are you using? Yeah, I didn't remember Leonardo having a sling... Cool artwork David. Haha, best blog post ever! Just the mockup and possibility of the Winter B&W Ltd. Ed. makes me giddy with excitement! And the con sketches are wonderful as always... I just love seeing these. Mice as TMNT and mice with Totoro? It just doesn't get better than that! Of course I also love the Ewok & mouse (the speared teddy bear is an awesome touch!) and the mouse fight by the river/chapel! Hello, I'm a great follower of your work, from Spain. First off thanks for your art. Anyway I want to say that Joel Mcneelie isn't the composer of THe Last of the Mohicans, this ost is composed by Trevor Jones and Randy Edelman and is one of more incredibles ost in the history of cinema music. 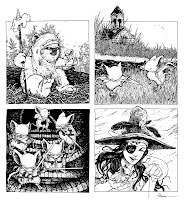 In my opinion the better choice for listenig while reading Mouse Guard is Willow ost by James Horner or Princess Mononoke ost by Joe Hisaishi. Perhaps Lady in the Water ost by James Newton Howard. Love the sparring in the field con sketch. A few music items I might suggest are Vangelis (Portraits): specifically "Conquest of Paradise", "Antarctica", "Chariots of Fire" and "I'll Find My Way Home". Ian Rushton (Spring Will Come Again), specifically "Spring Will Come Again", "Erin's Theme", "Aotearoa", "Simply Divine" and "From Dusk Until Dawn"
Agree with Red's recommendations! Joe Hisaishi's Spirited Away score is also amazing. I love James Newton Howard's Shyamalan soundtracks, especially The Village. My other fav soundtracks for listening to while working include The Piano (Michael Nyman), Gladiator (Hans Zimmer), Pirates 3 At World's End (Hans Zimmer) with one movement in particular that repeats throughout the film but only gets one short incarnation on the soundtrack, The Hours (Philip Glass), Firefly (Greg Edmonson), Serenity (David Newman) and Twilight (Carter Burwell), among a ton of others I don't have on my iPod at the moment. Way too much great movie music out there, often individual pieces. For example, I don't know if there's a soundtrack for Hancock, and I wouldn't necessarily care for a soundtrack of that film, but there was one moment in the film with a gorgeous piece of music. Red & Tom, Thanks for the suggestions!! And thanks to you Brandon for your suggestions as well! 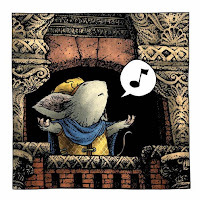 Is the Mouse Guard movie still a go or is it being put on the back burner?? "Dear Customer, Greetings from Amazon.co.uk. 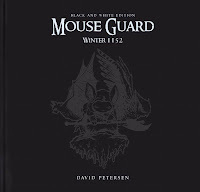 We regret to report that the release of the following item has been cancelled: David Petersen "Mouse Guard: Winter 1152" We are no longer able to offer this item for sale. Our supplier has informed us that this item has been discontinued and is no longer available." It's still up on their site for pre-order so I don't know what's going on. I may do some Sunday trudging around my LCS's to see if I can sniff out an import copy. Hi David! Congrats on the third week on the NYT Bestseller's List! And that Legend of Zelda artwork is awesome! As for playlist suggestions, in that video I put together I used John Debney's score for "Lair". It's like a cross between Lord of the Rings and Star Wars which I think you'd like ;-) I'd also recommend Steve Henefin's score for "Too Human", which has an epic Norse-mythology feel. Both of those are on iTunes, I believe. I could recommend a ton of 'em (I listen to these and more when I'm doing my own stuff), but those two are solid scores. Good luck with all your projects - Rachel and I are both looking forward to showing you some of our new work as it comes up! I recently saw a promo that you did for Henson and was wondering if your going to be doing any more work for them??? 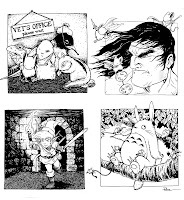 "Dear Customer We are writing in relation to your order which contained the following item: Mouse Guard: Winter 1152. You may have already received an e-mail informing you that we cannot source this item from our suppliers and that the item was cancelled. This message was sent in error and we have restored this item to your order." I have so many soundtrack recommendations for RPG playing. Some you can download off the net, some from itunes, etc: Shadowgate 64 video game ost (the internet) , Guildwars OST (directsong.com), Elderscrolls III: Morrowind and IV Oblivion (directsong.com), The Battle for Middle Earth I and II (iTunes), Final Fantasy soundtracks (iTunes, but the FF Tactics soundtracks have to be bought at amazon.com or or square-enix's estore), The official D&D soundtrack (iTunes), 2 cds by Dronolan's Tower (on iTunes), Record of Lodoss Wars soundtracks (amazon.com), World of Warcraft soundtracks (iTunes), Fable and Fable II soundtracks (iTunes), Lair soundtrack (iTunes), Medieval Songs and Dances (iTunes), Avalon (by Enaid on iTunes), A Soundtrack for the Wheel of Time (by Robert Berry on iTunes), Baldur's Gate series soundtracks by Michael Hoenig (get from some boxsets of the games on amazon.com), Icewind Dale music (same as Baldur's Gat soundtracks on amazon.com), anything by Jamie Christopherson (get some free downloads off his website, jamiechristopherson.com), and anything else by Jeremy Soule. Loreena McKeenit and Enya are celtic musicians, but I like them too. You can find them on itunes as well :0). 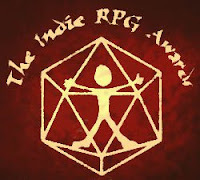 Thanks everyone for continuing to post your soundtracks for RPGs and creative endevors! Mr. X: I just talked to the attached producer last week to go over what is the best way to move forward. Morgen: Glad that was sorted out. It sure had me scratching my head. love the winter cover mock-up. 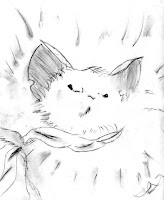 any chance of you posting a black and white sketch like you did for the fall edition?